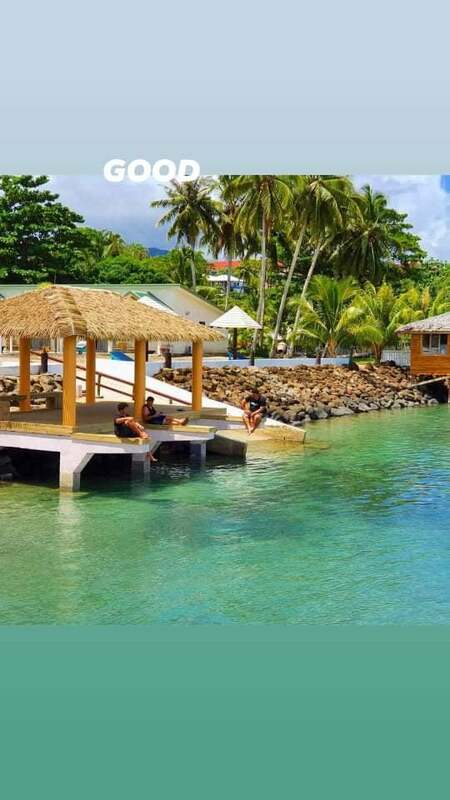 The hotel's unbeatable location at Faleapuna Village only 20minutes away from the Capital of Samoa, APIA on the island of Upolu. on the Leniu Estate is surrounded by peace & tranquility, truly a piece of heaven. The resort was developed by a local builder and resort owner; Schwarz Hunt who grew up on the very piece of amazing coastline. The resort was build carefully built around the natural environment, including one magnificent Tropical Almond tree that has stood proud for over 100 Years in the middle of the deck overlooking the ocean! With a private beach with amazing snorkeling just metres from your door. Our 4 star resort is located on a private property surrounded by a lush environment filled with wonderful sparkling waters, absolute beachfront accommodation featuring a restaurant, bar, outdoor pool and day spa. You can enjoy a relaxing massage on the beach or pool if desired. We serve a free tropical breakfast buffet daily. Leuaina Beach Resort offers a range of accommodations, from villas nestled in tropical gardens to beachfront suites. All have a balcony, air conditioning and a refrigerator. Indulge in the Premium Beachfront suites steps from the beach and swimming. Leuina Spa offers aromatherapy massages, body wraps, relaxing facials, manicures and pedicures. Leniu restaurant is located overlooking the water, featuring cultural shows and occasional themed nights. Our bar serves drinks and casual meals by the pool. Babysitting and light kids activities are available upon early request. Leuaina offers some of the best snorkeling in Samoa. Apia township is only a 20 minute drive away. Once booking has been confirmed rates will not be altered if specials or price change occurs, prices are subject to change without any prior notice. All online tariffs are cash rates and are inclusive of VAGST. If you pay by credit card you will incur a bank fee. We are situated on the northeast coastline of Samoa. Le Uaina Beach Resort is the newest and ONLY absolute beachfront resort on this part of the coast. We also have the benefit of being the closest beach resort to Apia (35 minutes away). We invite you to come and discover the untouched beauty of our retreat and immerse yourself in the Samoan culture at its richest. Spend your days here at Le Uaina relaxing, swimming, snorkeling, kayaking or basking in the sun - and let us take you on a tour you will never forget - exploring local fresh water pools, historical sites and our family treasures.